Big Brother 13 Spoilers - Kalia Da Hut: "I’m having a major Chima moment.. "
Dani tells Kalia to stop talking like their defeated.. They’re right back where they were 2 weeks ago and are down a number but not all is lost they have Porsche. Dani says they need to win HOH and put up power players (Like you did).. She’s thinking they should maybe try to cut a deal with someone. Dani thinks they options for deals right now are slim. Dani: “our only chance to stay in this game is to win comps.. it’s horrible but that is the game we have to play from here on in.” She tells Kalia to stop talkng about pulling a chima because if Kalia goes home Dani is screwed and if Dani goes home Kalia is screwed. Adam says that the only problem is now they have to get rid of Brendon again.. Shelly isn’t worried it’s going to be tough for them but once they get Dani out they can move on. 8:05pm Rachel gives Brendon a debriefing about the deal that DK gave her.. She says Jeff was being mean to her for Talking to DK. Rachel adds that it was almost like DK were threatening her. she was really confused by the whole thing. She never told JJ about the deal though so Brendon isn’t suppose to say anything. 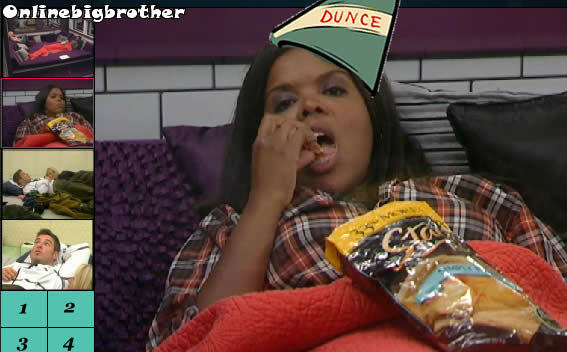 Rachel adds that Shelly is playing both sides She spends each night upstairs in the HOH. Jeff walks in Brendon asks him who he thinks is playing both sides.. Jeff thinks it’s Adam. Jeff is saying that adam and Shelly were both not really Happy about what just happened they are acting happy though. Jeff mentions that Adam told him last night that Brendon being gone was a bit of blessing because Rachel is such a mess. Jeff adds that word was getting around about BLANK they say around Adam and Shelly.. she’s starting to feel like they should rethink their “deals” with them. Jordan wants to rub it in her face but decides she better stay quiet. Jeff tells her that they need to lay low and let BR fight everyone else in the house. Jeff is positive that Shelly and Adam are talking to the other side so they need to just let everyone destroy themselves. Jeff instructs Jordan about how to deal with Shelly and Adam now. she’s not to not talk BLANK about anyone, especially DKP.. don’t bring up anything new just repeat what they say.. and never talk game with them ever again. If Dani nominates Jeff and Brendon again, I hope Jordon wins POV (very unlikely, only if cbs rigs it) and takes Jeff off. Then she is safe. Please get rid of Brendon again. All I can say is Porsche and Kalia better be on slop this week. Porsche needs to see how it is and she could stand to lose some inches in those legs. She is getting a little to cocky. I hate that Brendon is back, but it figures. CBS cannot get enough of Brenchel. Doesn’t seem interesting at all. Kalia is so stupid. If they would of stuck to their game plan and voted Rachel out (not put Lawon up) she would of had to compete against Brendon. Only one of them would be in the house, and I can take Brendon over Rachel any day. Please please please Brendon or Jeff win. Someone explain to me how there was 2 million votes, Brendon got 1 million but it was “close” between him and Dom. So let’s say Dom got 700,000 at least. That means that Cassi, who was leading this sites poll almost all week only got 250,000 maybe? I know that no where near 2 million people voted on here but shouldn’t there be some similarity between the polls? Either CBS rigged it or….yeah that’s the only conclusion I can get out of that. There is no way Brendon got half of votes. can some one please post a link to Lawons interview eviction? TEAM MUTHA F’N DANI YO!!!!!!! Hell yeah!!! Im sooooo happy Dani won HOH!!!!! It looks like dani or porshe won HOH. I was jumping up and down when Brendon came back (there are alot of us who are fans) then I saw Dani the Demon won HoH……..What ups and downs for both sides! JJ are my all time favorites t hough. Rachael does whine alot , but they do tend to try to show her in bad moments all the time. Kalia is the biggest crybaby .What started out a onesided game has gotten to be quiet interesting as time goes on. I personally don’t like Dani I’m team JJ but even though it disadvantages JJDani should get rid of Brendon or Rachel and if not Adam or Shelly. ‘Chima Moment’ was when Chima got screwed in BB11 by Jeff’s Coupe de tat power. Essentially her HOH was pointless as Jeff was able to usurp her power. Chima lost it and eventually left the game. And of course I agree, we know Brendon coming back was rigged. I predict CBS will continue to play this couples theme as long as they can before they have to change the name to ‘Love Connection’. Big Brother 13 Spoilers – Fifth Live Eviction and HOH RESULTS!